Firstly, We aim to find and consciously apply reliable ways of creating experiences that will bring us in contact with beings from the non-physical realm. How we do this varies across cultures and epochs; why we do it is a matter of personal concerns for each of us and our ancestors. What unites us as magicians across millennia and continents, however, is the joint urge to push beyond the boundaries of the physical realm and experience the divine. Ill fate, a string of bad luck, sickness, psychological sufferings, even the loss of a job or of loved ones - from a magical perspective all of these experiences are expressions of milestones in our lives which we subconsciously attracted or/and which were actively brought upon us by beings from the inner worlds. What roles these beings play in this, wether they are simply messengers or mediators - the cogs in a wheel that is much bigger - or wether they are active agents with a certain level of free will, doesn’t matter at this point. What matters is this: we are constantly acting on the outer and inner level, we constantly engage in interactions with beings on the physical and non-physical plain at the same time. There is no way of stopping it. It actually is what life is all about. All we can do is to search for ways how we can partake in these dynamics more successfully. These thoughts brought me to the question that many magicians have asked before: Is it possible to identify and describe the basic mechanics through which these interactions are made possible? What role do our emotions play in it, what is influenced by our desires and appetites? What is this thing called True Will and what difference if any does it make wether we respond to these experiences in thought, speech, practice or ritual? I guess these questions point to the heart of the matter, towards a basic model of magic. Now, before we go there let me share some context on the use of ‘models’ in light of this. My background is in communication science, i.e. the science of how communication works. Since the early days of Plato there have been myriads of models to explain the complex processes that make up this thing called ‘communication’. As mentioned above - the value of each of these models was never intended to be the refractory arch stone of communication. Nobody was ever foolish enough to assume they had completely figured it out - at least that’s what I always hoped when I looked at their models. Yet, the intention was to continuously enrich the tradition the researchers were part of. Each model was another light that shone on the subject matter from a different angle. Taking the view from each angle, one at a time, our understanding of how communication actually works would constantly expand - until a complete 360° view could potentially be achieved at some point in the future. So below is the light that I want to shine on the subject. As I said - it will always be work in progress and even as I am writing this I am working on two subsequent models which take a different angle on the very same subject. This first model focusses on an inner perspective of experience only. The first stage show the various layers of purpose that lie on top of our true will. Other models use this section to speak about the unconscious or collective unconscious. I believe this term rather blurs the conversation. 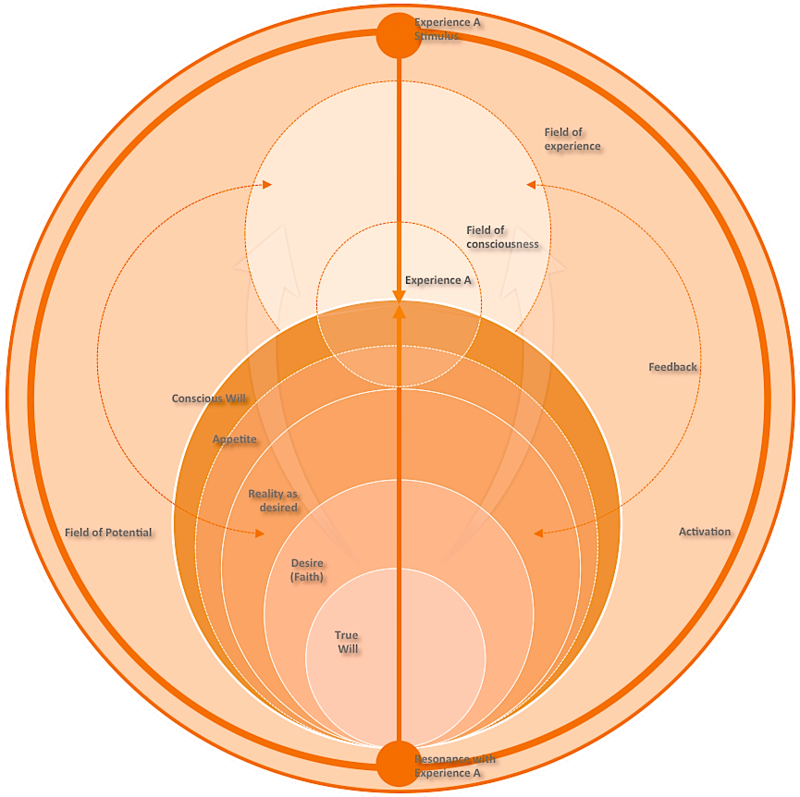 Thus in this model our True Will is thought of as a gateway in two directions: one leading up to our conscious mind, the other leading downward into a 'field of potential'. This field has been called many names in the past - astral light, aether, collective unconscious, etc. - whereas I try to keep the terminology as simple as possible. In the second stage we explore the make up of our own field of consciousness. Inside ourselves it stretches down as far as to the layer of our everyday will and appetites. Outside of us it only covers a tiny proportion of the experiences we are actually part of any given minute. A feedback loop exists between our field of experience and 'reality as we desire it'. I.e. what we actually experience constantly shapes our desires about what we hope or don’t hope to experience next. Much of this happens without our conscious engagement of course. The third stage shows how an actual experience comes to life. It is initiated by an interaction between our True Will and what I called the field of potential. A deep inner resonance or readiness is born to experience certain matters. What I mean by this is the following: all experiences lie around us in wait at any point in time. Everything is always present. What limits and thus defines our individual route through these experiences is our inner readiness to partake in them. It is this 'readiness to resonate' that in turn activates the stimulus of the actual experience outside of us (called ‘Experience A Stimulus’). Now that we are experiencing a certain matter it is up to us to chose how we want to react to it. We have to define our behavioral response. The four basic layers or tools of behavior that we possess are thought, speech, practice and ritual. Each of these expand our reach for new experiences inside and around us in return a little further. While the first three are self-explanatory the last one might need some further detail: Please think of a ritual in this context not necessarily as a magical rite. Our behavioral answer on this level could be a magical ritual. Yet, here the definition of a ‘rite‘ is broader: it is any behavioral response that brings thought, speech and practice into a unified bond through focussed intent. That is why it’s impact within us reaches much deeper than the other three layers. It creates power through combining all of our means of communication into a state of ritual single-mindedness. And this is it. Five layers of inner purpose within us and four levels of behavioral response we can chose to apply on any experience triggered by the former. Together they create a perpetual motion machine of continued new (or repetitive) experiences - each feeding off the effect and impact of the previous one. The value of meditation, dark night retreats, visionquests, etc. thus is obvious. They are means to break through established patterns of experience within us. Once this ‘experience machine‘ within us has become well oiled and automated by the time we reach adolescence normally, it becomes incredibly hard to create resonance with truly new types of experiences. Normally most of us get caught in repeating experiences we made before in slightly different shades and flavors. Life - and our inner friends - have their own means of breaking through these behavioral patterns. Unfortunately some of these can be rather rough and tough upon us. The opportunity we have at hand is to do the job ourselves and thus to spare us much trouble life will get us in otherwise. How do we do that? 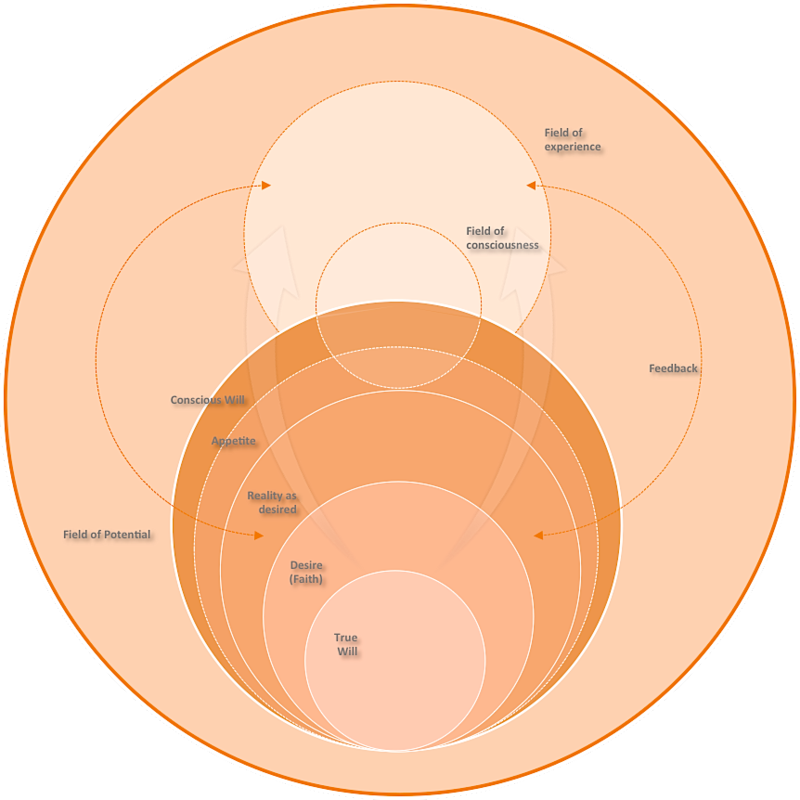 We meditate on the different layers of purpose described in the model. We learn to listen to ourselves. We learn to understand where our motives stem from: Wether they are expressions of our appetites, urges to bring reality in line with what we want it to be or desires residing deep inside us. All of these layers of ‘want and will’ are genuinely human and have their own appropriate ways to be unfolded and experienced. Yet, once they block off the experiences our True Will is trying to get in resonance with - that’s where all the trouble starts. The message is not either-or, black or white, but finding the right shade of grey at any moment in time. We can live according to our appetites, desires and dreams of reality - just as long as we keep this one passage open: for fearful thoughts and frightening new experiences to emerge all the way from the field of potential, through the filter of our True Will and into the center of what we experience everyday.